Stormy Monday Painting & Color Design- NOW RETIRED FROM THIS AFTER 35 YEARS. Thank you for taking this opportunity to explore and discover the many ways we may serve you. Our sole purpose is to leave our customer extremely pleased that they chose Stormy Monday Painting and Decorating to fulfill their painting needs. Allow us to fill your office or home with luxurious, warm colors and one of our many elegant Fantasy Faux Creations. They are legendary! Each is unique of itself. The colors and design elements are created specifically for your space by Nationally known Artist Stormy Monday. Stormy Monday has a proven track record. For over 35 years, Stormy has explored all aspects of painting, focusing on each project with unbiased enthusiasm and equal importance. Our trained professionals are extremely talented, polite and will complete your home or space in a timely, organized manner to respect your daily life. Yes! We love to do new home construction. Communication, Honesty and Reliability to the Builder are traits I personally keep a keen eye on as we progress through the course of a new home, in a timely manner. We work well with other trades, respecting their finished product. I understand the sequence of events very well and will always communicate changes or adjustments immediately to my crews. Allow us the opportunity to paint one home for you. 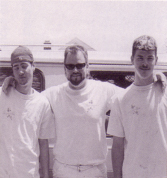 Pictured above is Stormy Monday with his two oldest sons, Calen on the left and Jesse Miles on the right. Both are artist level painters. Although I’m now retired and enjoy my passion for creating art at STORMY MONDAY ART, my sons still do custom, hi-end painting. We, at Stormy Monday Painting and Decorating have countless home-owners who will gladly tell you, in their own words, about our work. Many will invite you into their homes so you can see, firsthand, the absolute warmth, beauty and elegance left by our professionalism. So, ask me for references and I will gladly oblige! We are committed to creating the most beautiful paint job and most breath-taking Faux-finish in each home or space we do. NO SHORT-CUTS, NO CHEAP PAINT, NO LACK OF PREPARATION! That makes and keeps us GREAT! Stormy can also paint murals, texture glazes, glazes, marbleize & color washes. With Stormy, anything is possible. The finished product reflects our experience level. 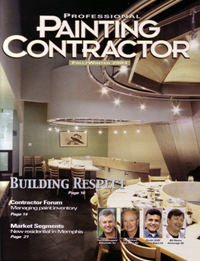 “In My Own Words” as printed on the outside back cover of Fall/Winter 03 issue of PROFESSIONAL PAINTING CONTRACTOR magazine. “My Painting business is successful because I believe in what I do. As a third generation Painter and professional Artist, my father taught me early in life to cue in my third eye to the smallest of details. He taught me the importance of focus on every aspect of the job. As my experience grew, I learned to do each job in a timely manner and to never inconvenience people any longer than necessary. I also learned to never take shortcuts and always walk each job at its completion to eliminate unwanted surprises. With my well trained crew of six, we have a consistent process from quote to clean up. I assist in color selection, ideas and details and we offer hundreds of fantasy faux finishes, warm, luxurious paint jobs and work that is complete only after the customer is 100 percent satisfied. Back in the sixties, my father emphasized the use of quality Sherwin Williams products, and after countless paint jobs of my own, I truly understand why. Trends change, but our service and professionalism will remain constant and current. Call Stormy Today For Your Free Quote – (309) 643-3452…. Actually, as of January, 2018, you can call this number for commission art pieces, murals and Stormy Monday PAINT PARTIES! We be ‘PAINTIN’ UP A STORM’ … Call me today!!! !